The International Day of Zero Tolerance to Female Genital Mutilation (FGM) 2019 Theme: “Building a solid and interactive bridge between Africa and the world to accelerate ending FGM by 2030”. 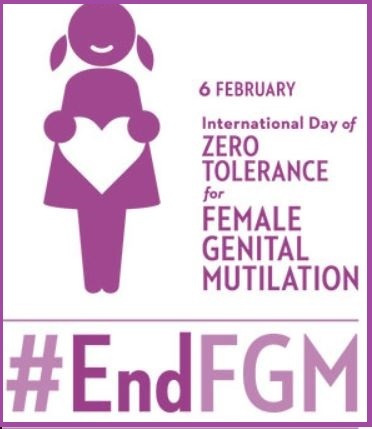 The International Day of Zero Tolerance to Female Genital Mutilation (FGM) is recognized internationally as a violation of the human rights of girls and women. It comprises all procedures that involve altering or injuring the female genitalia for non-medical reasons. Female genital mutilation (FGM) means removing or injuring the female genitalia for non-medical reasons. This practice is considered as a violation of girls’ and women’s rights all over the world. UNFPA (United Nations Population Fund) and UNICEF (United Nations Children’s Fund) are organizing a world-level programme to eliminate FGM. Its main focus is on 17 African countries. Nearly 200 million girls and women living at present have undergone FGM. It is mainly practiced in 29 countries in Africa and the Middle East. It is also followed in certain countries of Asia and Latin America. The practice also violates their rights to health, physical integrity, security and their right to be free from torture and cruel, inhuman or degrading treatment, and right to life. The 2015 Sustainable Development Goals (SDG) calls for an end to FGM by 2030 under Goal 5 on Gender Equality, Target 5.3 Eliminate all harmful practices, such as a child, early and forced marriage and female genital mutilation.